From 0,4 to 8 meters with one pedal stroke. This is the setup on my latest ICE Adventure FS for a client with Multiple Sclerosis who would like to be able to pedal hills also when she runs out of battery power. Why this setup? Climbing steep hills without much effort or strength is really possible on a recumbent trike with the right gear setup. So you need to add an additional gear system in between. And from what I know there are three options available, but I suggested MountainDrive or Pinion in the middle. Neither of them are officially available in such a setup of course. As both are installed within a BB. But since we already have a motor there we needed to hang a gear system onto the frame between the motor and the rear wheel. My client decided for Pinion as she liked the idea of 18 internal gears. So the request was: to have a motor which will be able to climb steep hills and to have a very low gear for when the batteries run out (below 0,5m per crank revolution). And I tried the setup yesterday on an 18% hill. It felt like flat and no pogo effect. Also no bending of the front boom which occurs if you install MountainDrive there. As the 1:2.5 conversion appears within the BB and you have much higher forces in the chainline. While here with the Pinion under the seat, you have high rpm on the boom section and conversion into a higher gear in the middle. Which reduces stress on the boom. 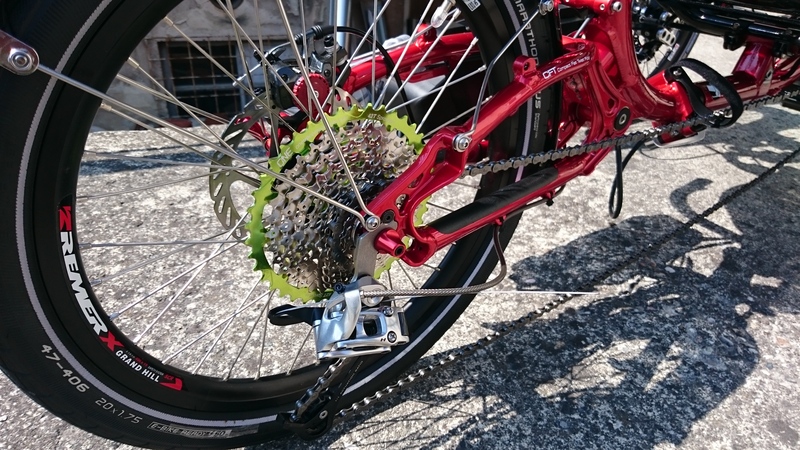 And because of high rpm there are also no peak points in pedal pressure and thus less pogo. You just have to forget about time. It will be interesting to see how this setup behaves in real life. 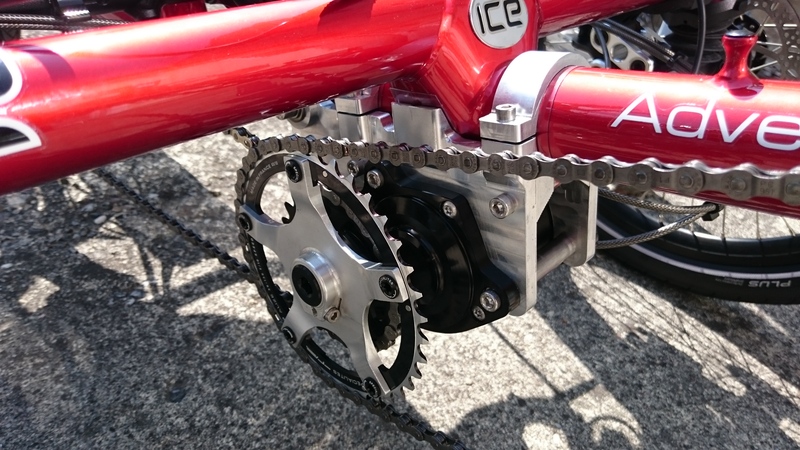 I guess a tensioner could be added to the front chainline, but I do not think it is necessary. We will see. 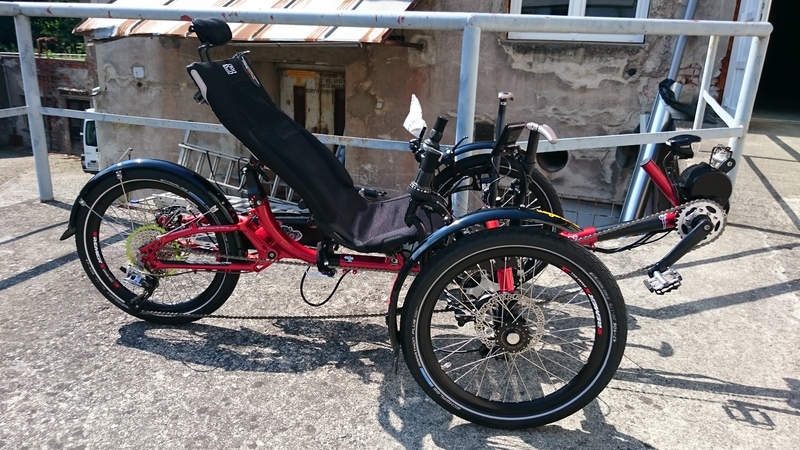 It is a prototype and first of this kind but I wanted to show that we can achieve really low gears on a trike for climbing steep hills without much effort. As this is actually the whole point of a recumbent trike. And ICE Adventure FS is ideal for this. I hope this custom setup allows my client to pursue her dream to visit South America next year.